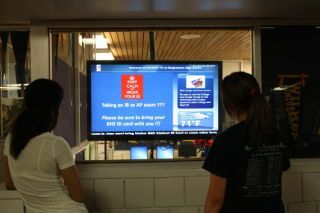 The Binghamton School District in the central-southern tier of New York State has discovered a way to communicate with high school students, faculty and parents at once, creatively using digital signage technology from Tightrope Media Systems to deliver information inside the school and over the web. Branded as Patriot TV, the school district rotates morning announcements with regular updated information on school events, weather and more to nearly every space in the Binghamton High School, reaching 1700 students across grades 9-12. Using Tightrope’s Carousel digital signage solution, the school broadcasts feeds on classroom SMART Boards and large monitors situated inside the cafeteria and within common areas. Additionally, Patriot TV feeds are replicated 24/7 on the school’s website, accessible from the front page. This has the added benefit of giving parents an easy way to keep up with district news, school closings and other important information. This multiplatform approach was the driving influence behind adopting digital signage as opposed to more traditional methods. An initial plan of launching a basic, traditional TV broadcast for morning announcements quickly transitioned to digital signage when its benefits of reaching wider audiences became clear. And of all solutions explored, Lawrence Kassan, Coordinator of Special Events for the Binghamton City School District felt Tightrope offered the best mix for creativity, content management and price point. The Patriot TV output consists of four discrete zones and a constant data crawl of the morning announcements. Ease of use is another major benefit, according to Kassan. Time-sensitive content is often added on the fly. Though Kassan currently handles all Carousel operations, the quick learning curve will allow him to train students and other faculty members heading into the 2014-15 school year. Carousel’s user rights and permissions will help him facilitate the types of bulletins that can be created, screen areas that users can access, and advance content approval. The opportunity to train other departments, like their visual arts department, to use Carousel is especially pertinent given the school’s reputation as a creative force.